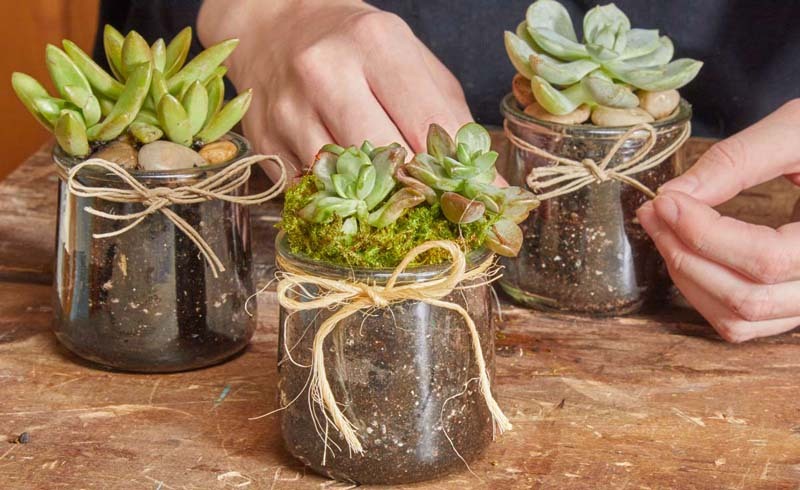 Glass yogurt jars are perfect to use as succulent pots, and they make great DIY gifts! For those still learning how to achieve green thumb status, succulents are a perfect low-maintenance plant. Just make sure to place them in a sunny spot and water them every other week. There are also many creative ways to display these plants and we especially love the shape of the glass Oui yogurt jars (the yogurt inside is yummy, too!). These jars are recyclable, of course, and make great little containers for all sorts of things like paper clips, nails and screws. However, we decided to fill these cute jars with succulents. First, soak the labels in hot soapy water. Use a bucket so the labels don’t go down the sink drain and cause a clog. After the labels are off, scrub the residual adhesive off the sides and rims of the yogurt jars. We found that Orange Goop hand cleanser worked best when used with a stainless steel scrubber. The stainless steal is tough on the adhesive and doesn’t scratch the glass the way sandpaper did. 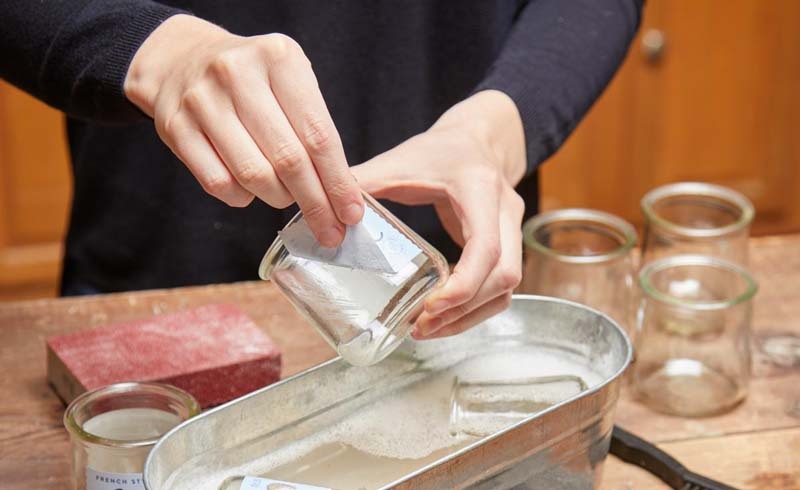 However, the adhesive around the rim of the jar is especially tough to get off, so we used sandpaper figuring that the succulent would cover the minimal scratches on the glass. Rinse the jars well and dry completely. 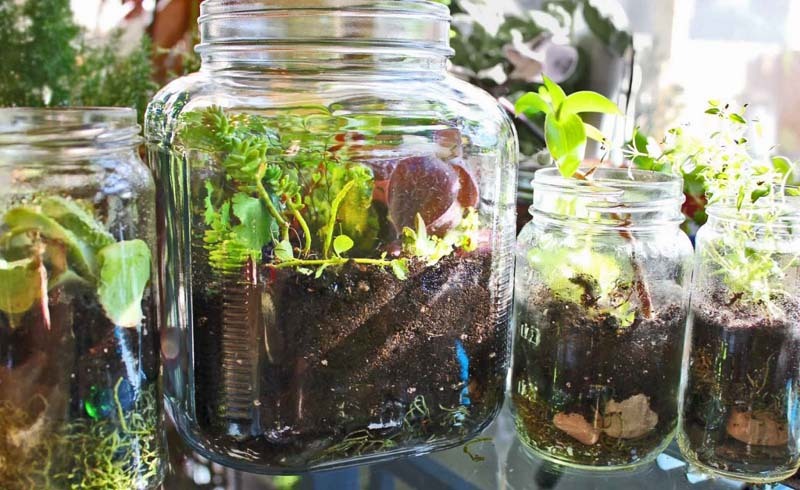 Once clean and dried, cover the base of the glass jars with potting soil. 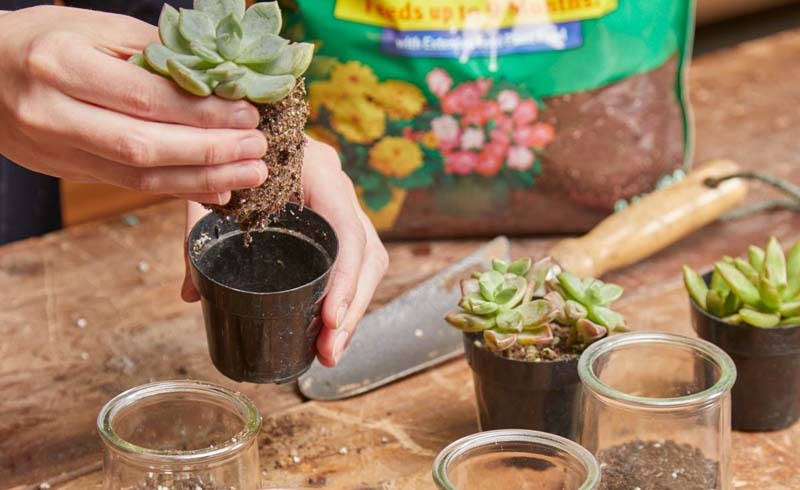 After doing so, remove the succulents from their plastic containers and move them to their new home in the glass jar. 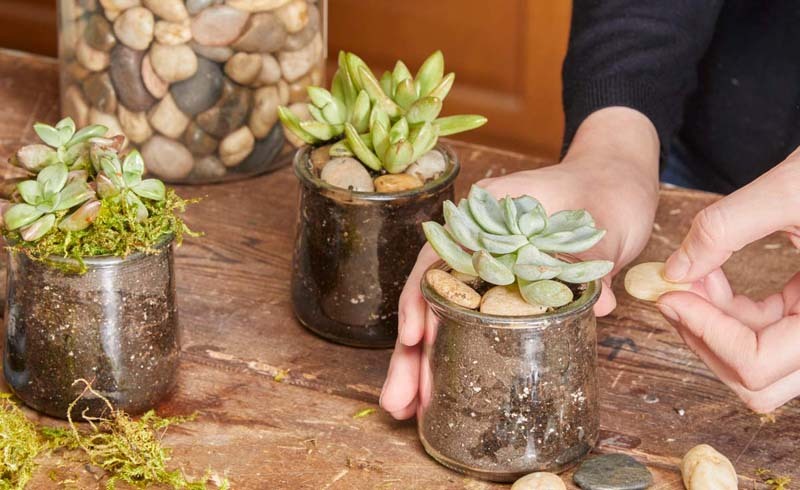 Next, fill the rest of the jar with potting soil and around the sides of the succulent so it doesn’t wiggle around. Tap the jar on the counter or use a toothpick to spread out the soil and water, when done. It is also important to note that succulents don’t flourish when they sit in wet soil, so don’t over water your plant. Only water the succulent when the soil is dry and never water when wet or moist. 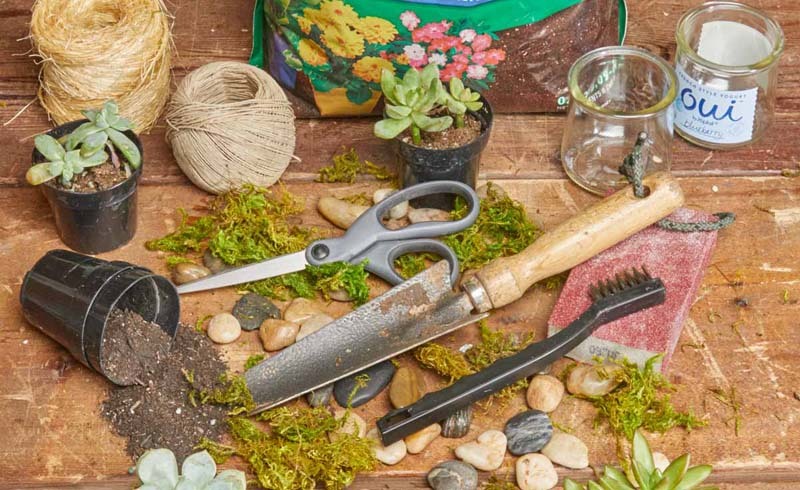 And if you are worried about over watering your plant, place pebbles or gravel at the base of the glass jar to allow for drainage. 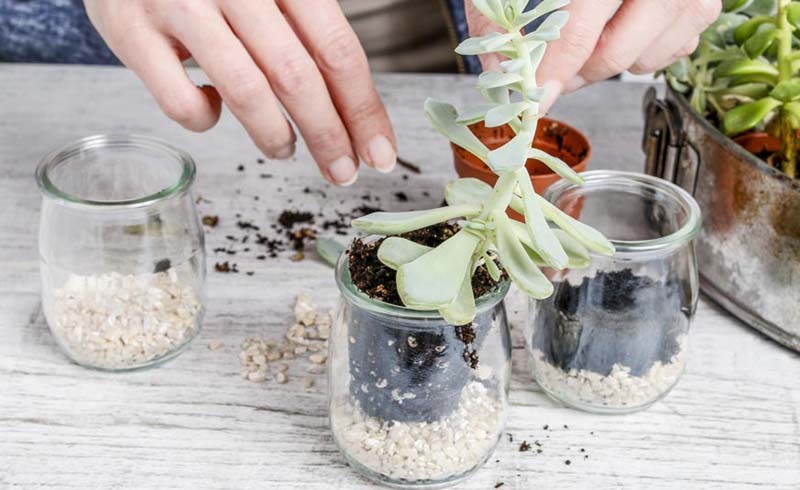 To create more of a polished look for your recycled glass jar succulent project, add some pebbles or moss to cover the tops of each jar around the plants. Use any kind of twine to tie around the top rim of the glass. 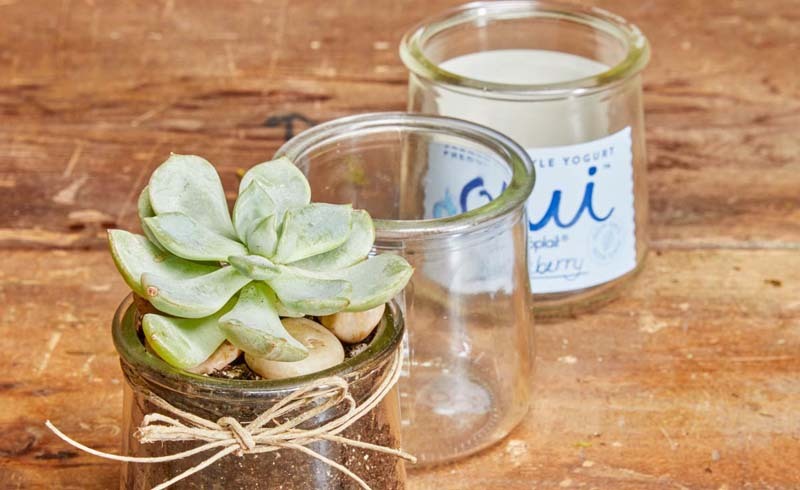 These little bows add a completed touch to your glass succulent jar. Give the succulents as gifts or as wedding favors but be sure to keep one for yourself!